Hair must be at least 1 inch in length or longer. Permed hair must be removed before locking. Natural starting locs take from 3 months to a year and a half to fully mature depending on ones hair type. 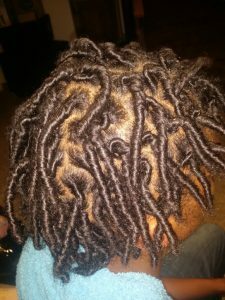 Once you begin your “Journey” you should be getting a retwist every two weeks. 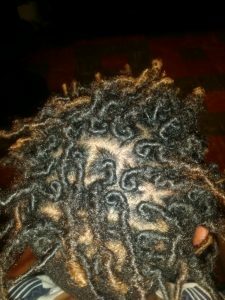 This two week interval should last about one and a half months to two months.Your locs should be retwisted once a month to every 6 weeks in most cases after that. They may look fuzzy at times during the entire process, but the hair must be loose enough to loc on its own thus avoiding styling at this time. 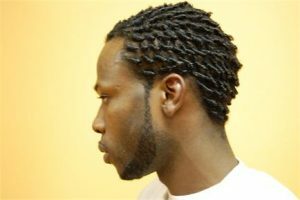 We usually retwist in a manner that prolongs the style. Professional washing can be done during this period and is recommended so that washing your own hair doesnt unravel unexpectedly. The back rows may occasionally unravel before the front and top but this is normal and can be managed. Starter locks in our definition are comb twisted to start the coiling process of mature locks. 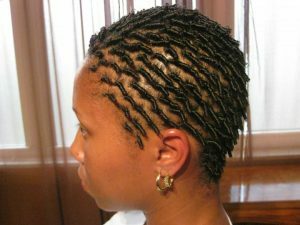 We also dry twist and finger twist as well as two strand twist. There are many methods to starting locks. They usually take from 3 months to a year to reach loc maturity. If all else fails or by request, we can also style instant locs using your natural hair only or interlocks with a tool for hard to lock hair. These methods are simulated enhanced starter loc processes in which we literally ‘design’ each loc to resemble a mature dreadlock. Since starter locs aren’t guaranteed for every client, this method is an excellent way to ‘force’ locs on your difficult to start hair. This method can be used on natural unprocessed hair and in most cases, straight, silky and wavy hair. Click here for a quote on Instant Locs instead. 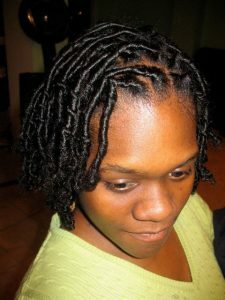 Or for tooled locs on fine straight or wavy hair you should go for Interlocked locs. You can also bypass length and maturity by getting Permanent Dreadlock extensions.